I spent an inordinate amount of time today getting ready to hike the Appalachian Trail (AT). I don’t know when I’m going to accomplish it, but I know that I will. Because I’m planning to do it now. Back in 2013, I was supposed to mobilize and deploy to Kuwait for a one-year support mission. I was at pre-mobilization training (PMT) the summer of 2012, and they ended up cutting the mission in half, and decided not to send the surgeon section. I was the 38th Division surgeon’s plans and operations officer, and ended up as part of the rear detachment. Not fun stuff. 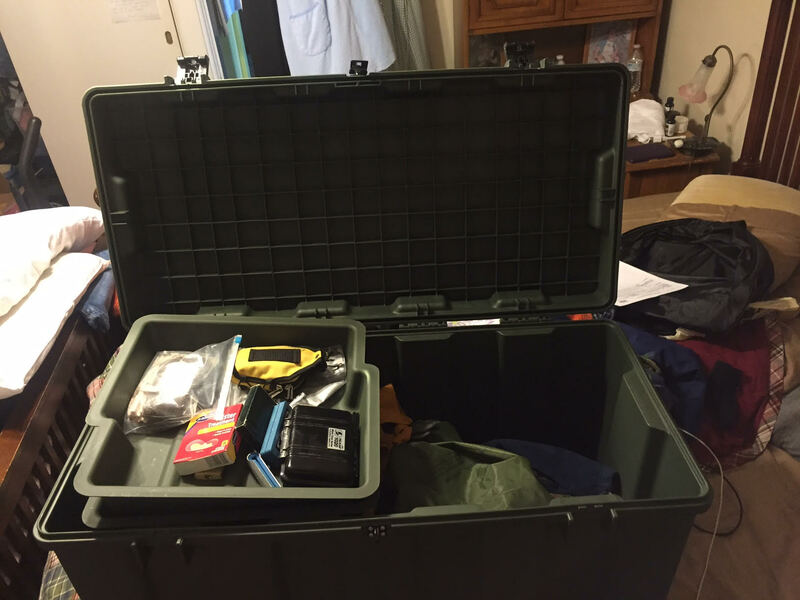 But I got to keep this cool green box in which I can store all of the stuff from my AT hiking equipment list. I keep that checklist as a checklist in Evernote. It is based on the advice of lots of folks who have already hiked the AT and learned lessons I don’t need to learn first-hand. They learned what to take and what not to take, I’m taking what they took. I’m not taking what they sent home or didn’t take. Pretty easy math, huh? So the time I spent today, what did I spend it doing? Finding out what I already had, and putting that stuff in the big green box. Want to know what is in the BGB? I bought a synthetic short-sleeve button down shirt from Ex Officio a few months ago. It rocks. It’s made from recycled water bottles, and dries in about five minutes. I have both a short and long sleeve moisture wicking compression shirt of the Under Armor brand. They keep the sweat off of my skin and stop me from stinking in the pit area. I’m taking a mid-weight synthetic long sleeve fleece top from Sierra Trading Post from my last employer. It’s blue. It’s warm. It’s going. I already had a pair of lightweight synthetic trekking pants that zip off at the knees. Those will be my day-to-day bottom half outerwear, and they were produced for the Boy Scouts of America. It’s my nod to the six excellent years I spent in the BSA, eventually winding up an Eagle Scout. There was an optional line there for underwear, which on a hike are simply a bother. Don’t tell my mom, but I’m going commando. I also have a fleece toboggan of military heritage. It’s camel brown and I love it. I wear it everywhere in the winter. I also have a Columbia Titanium sun hat that I bought before accompanying my son to the 100th Anniversary Camporee in the BSA National Capitol Region (NCR) at Goshen Scout Reservation. I’m indecisive on which pack I’ll carry, but I’m leaning toward the Osprey Atmos 65 AG pack at this point. By the time I buy, they may have newer models out. We shall see. I already have a great winter sleeping bag, the North Face Furnace, but it is much too warm for summer camping. I’m sure I’ll carry it from Springer Mountain in late March or April until the end of May or so, at which point I’ll mail it home and possibly re-delivered further up the trail in September. In the interim months, I’m looking at another North Face bag, the Aleutian 35, for the warmer months. have in my possession right now a ThermaRest self-inflating air mattress that compresses down to just about nothing for packing. That will be going with me. The military was nice enough to let me keep my issued waterproof bag. It is large enough to slip over a five gallon bucket, so it should store all of my stuff that has to stay dry. I’m undecided on which tent I will pack. I know I’m taking a fist sized hammock for the warmer months, but I’m debating whether to get an REI Quarter Dome 1 tent for regular use. Of course, when I can stay in a shelter, I will, but when I can’t I will opt for the hammock or the tent. Options, people, options. Footwear? I know I’ll probably go through three or four pair of shoes, but which shoes will they be? Methinks Merrell Moab Ventilator mid-ankle hiking boots will do the trick, or possibly the low-rise shoes. In any case, I know the inserts will be Superfeet premiums. Heard enough trail tales to know that the only way to hike is over Superfeet. Trekking poles? Yes, I’ll have a pair. Don’t know which ones yet and don’t care. Headlamp? Same deal. The PX has a lot of really geared up options, so I may try out one or two of theirs. They have a liberal return policy and there’s a PX only 20 miles from my house. Within biking distance. I had to turn in my military issue CamelBak water bladder system but I know I’ll be getting another one for the thru hike. I will be cooking over the JetBoil Flash, which features both the burner and the 16 ounce cup and cosy and has been getting rave reviews. I’m a peanut butter and banana kind of guy, so I know I’ll be packing lots of PB, and dehydrated banana chips along with oatmeal, cinnamon, and nuts for the most part, but I also have an ample supply of MREs to bounce down the trail from a long military career. They keep for a long time. You tear open the foil pack and sniff. If it doesn’t stink, it’s still good and you eat it. If it stinks, you eat peanut butter. My water will be purified, along the trail, by a Lifestraw personal water filtration unit. I’ll also find an inline unit that has good reviews. I’ve already picked out my Nalgene bottle, and it is in the BGB. I also have a really nice single folding blade knife that my daughter found walking along the road one day. It’s a Gerber it’s sharp enough to shave with. My first aid kit already has mole skin for blisters, an assortment of bandages, salves, wipes, and OTC meds such as the indispensable Advil, Immodium, benadryl and pepto along with sunscreen, foot salve, and bug dope. I’ll consult with my doc before the hike to get a round of broad spectrum antibiotics. No hike would be complete without a map and compass. I’ll also have a Garmin GPS unit if needed, and AWOL’s trail guide, so I should be fine. You’ll be happy to know that I won’t be wearing deodorant or bathing regularly, but I will be bouncing lots of toiletries ahead of me so I can indulge when I hit a town. I have a mini-moleskine notebook and an anti-gravity pen that writes on anything for those moments when a brilliant idea hits and the mobile phone is dead. And of course my iPhone will be attending with me for taking video, pictures, journaling, and finding out where the hell I am if I get turned around. I have a very nice set of sunglasses/protective eyewear from the military and it will be going with. And for entertainment? Kindle Paperwhite with charging cable and wall plug. I already have a waterproof case in which to put it. What if I don’t feel like reading in camp? Hoyle. All weather infrared readable playing cards. Shelled out ten bucks for them a few years ago and friends, they work. You can have a full blown Euchre tournament in the middle of the Hundred Mile Woods in the dead of night with a red flashlight. I also bought a cheap harmonica so I can offend everyone I meet for the first month or so. By then I should be playing like John Popper. That is basically it. Most of that stuff will be traveling on my back for about six months. Do you think I’m “all in” enough?